One can imagine that the way we envision our lives to be, is being influenced by our perception of the world. There can be a divide between viewpoints which will affect us accordingly. On one hand, we can see a bright and hopeful future, full of opportunity. On the other hand, we can see difficult challenges ahead and would prefer to substitute our circumstances with a more simple, bygone, time. where there is light, there is shadow. Ooohhhh the enthusiasm is palpable! Can you feel it!!?? I’m sure you can, because I know you ♥♥♥ LOVE ♥♥♥ Swarovski sparkles as much as I do! Swarovski’s presents Scarlet as the newest note-worthy color in their Fall and Winter 2018/19 line. This first-rate, elegant shade of red, is the red-letter color choice for truly stylish occasions. The enticing allure of this new Scarlet red crystal color can be distinctly defined as, opulence embodied. This enchanting shade is now available throughout Swarovski’s product range in numerous shape and size options to enhance your jewelry designs, dance costumes, and creative endeavors. 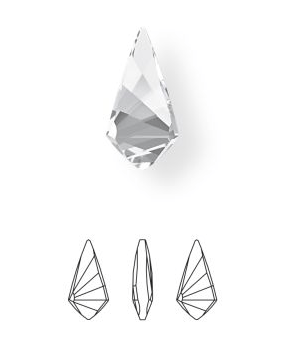 Best of all, this chic new Swarovski color contains no cadmium, which is environmentally responsible. The newest Swarovski Crystal Pearl Color called Velvet Brown exudes a decadent, elegant and enriching quality, reminding us to celebrate the finer things in life. With it’s vintage luxurious feel, your jewelry designs will be enhanced further with an allure of sophistication and grace. The New Swarovski Crystal SHIMMER Coating was first applied to Flatback Rhinestones to especially brighten up the dance sport industry, and now you will be able to enjoy this captivating effect on Crystal Beads, Pendants, Round Stones, Fancy Stones and Sew-On Stones. Swarovski continues to collaborate with new designers and influencers to create truly innovative, eye-catching designs that WOW us! This Fall and Winter season, we have been give a real treat. 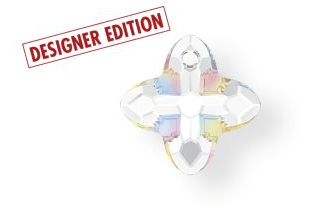 The Swarovski Designer Edition Series features Iris van Herpen with her Growing Crystal Line, two different Crystal Pendants inspired by the creative power of nature. 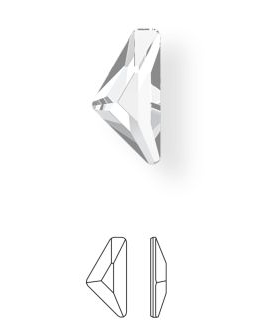 The first new Swarovski Crystal Designer Edition Pendant is the 6926 ‘Growing Crystal Rhombus,’ Pendant pays homage to the fractured and fissured elegance of crystals shaped by tectonic forces. 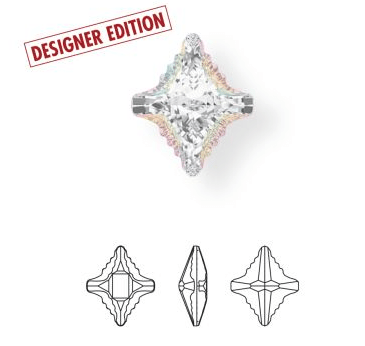 The second new Swarovski Crystal Designer Edition Pendant is the 6925, ‘Growing Crystal Rectangle,’ resembles the cross section of a druse crystal in both brilliance and complexity. In addition to the pendants she imagined for the Designer Series, the collaboration with van Herpen also triggered Swarovski to create special 3D Studs, which make it simple to achieve eye-catching relief. Available in three heights, three different plating options, two different cuts, and twenty color and effect options, they are ideal for adding texture and relief to garments for added design freedom. 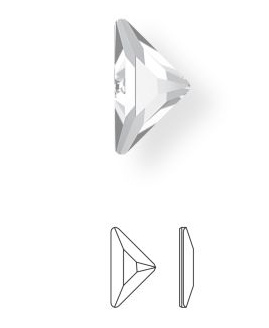 SWAROVSKI innovates and brings to life the finest precision cut crystal in the world and has remained established in this prestigious position since 1895. 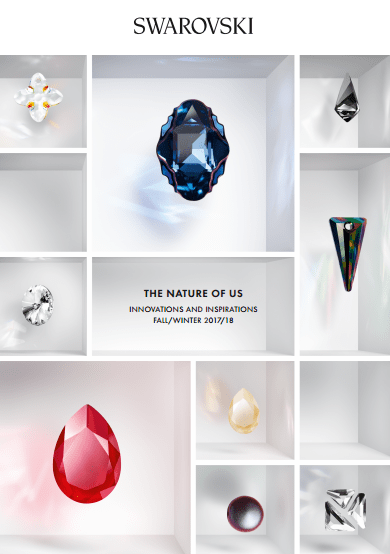 To mark the beginning of the SPRING/SUMMER and FALL/WINTER seasons, Swarovski unveils their newest Crystal Innovations for crystal lovers to be amazed and inspired by. See The New Swarovski Crystal Fall/Winter 2017/2018 Innovations! This very unique and innovative coating from Swarovski will rejuvenate your jewelry designs in a whole new way! 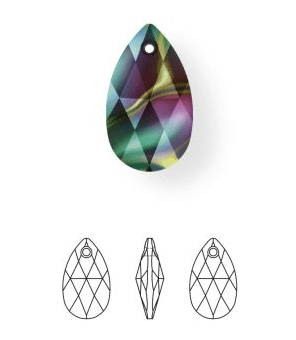 The Crystal Rainbow Dark Coating is an interesting metallic effect showcasing dark oily patterns on top of the crystal and is available in the Swarovski Crystal Beads, Pendants, Flatbacks, Round Stones and Fancy Stones. This unique dark rainbow oily coating will have a unique pattern on top of each Crystal, effectively providing you with a different look on every single piece! This New Swarovski Coating is quite exciting! Never has there been a coating that will provide you with a unique design on every singe Crystal that you work with. 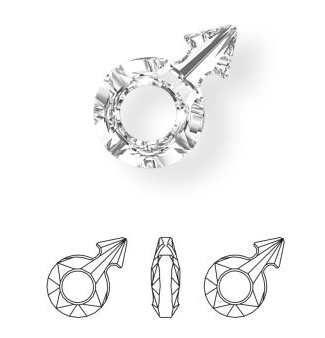 This will open up new design possibilities and accommodate the ever growing demand for individualized jewelry, catering to the idea that each individual is unique and therefore each person should have the opportunity to wear and create truly one-of-a-kind pieces. The new Swarovski Crystal Shiny Lacquer Coating perfectly resonates with the current consumer mood, where sophisticated shine meets refined sparkle. This new Shiny Lacquer Effect highlights a strong new direction for crystal, the three on-trend hues of Crystal Ivory Cream, Crystal Dark Red and Crystal Dark Grey convey a sense of timelessness in a subtle reduced color palette speaking of heritage and authenticity. The three classic gem colors – Crystal Royal Blue, Crystal Royal Green and Crystal Royal Red – create allure with their timeless popularity and versatility, thereby adding seductive color injections to individual eclectic styles. The Crystal Ivory Cream Shiny Lacquer is a soft and elegant effect mixing together a yellowish, whitish, tan color combination resulting in a graceful hue with a touch of shine and sparkle. The Crystal Dark Red Shiny Lacquer is a deep coral like or red wine type of color, similar to the Siam red but not quite as dark. The Shiny Lacquer coating is applied to the top of the crystal, creating a refined shimmer exposing the rich red tones underneath. The Crystal Dark Grey Shiny Lacquer is a timeless deep elephant gray tone that has is chic and refined style that is on-trend and especially popular in the fashion and design industry for its modern sophistication and versatility. The Crystal Royal Blue Shiny Lacquer was inspired by the luxuriously vivid blues found in genuine sapphires. Harkening back to imperial traditions where stately figures adorned themselves in opulent gems vivid in color, the Swarovsi’s Royal Blue Coating is a splendor of medium blue tones highlighted by a tasteful luster. The Crystal Royal Green Shiny Lacquer is a charming emerald green tone, created to emulate the rich and majestic colors found in an authentic emerald gem. This regal hue is accentuated by a subtle, yet stylish shimmer that captures the graceful and intriguing radiance within a true emerald. The Crystal Royal Red Shiny Lacquer is saturated in a rich pinkish-red mixture inspired by the imperial tones found glowing within an authentic ruby gemstone. This lovely color evokes love and passion, and the exquisite vibrancy is enhanced by a touch of sparkle that radiates with mesmerizing beauty. This innovative Shiny Lacquer coating is an entirely new interpretation of crystal coloring for your jewelry designs. This is a wonderful mixture of shiny surface and an opaque backside in different lacquer pro colors. 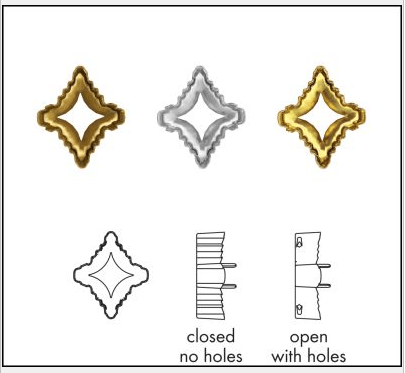 For now, this new Shiny Lacquer effect is only available in Swarovski products that do not have holes, such as the Round Stones, Fancy Stones, Flat Backs Hot Fix and Flat Backs No Hot Fix and related forward integrated solutions. This new Swarovski Crystal Pearl Color is very interesting and continues with the on-trend iridescent look. 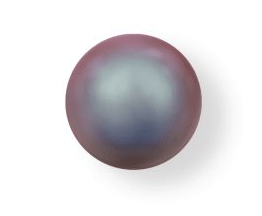 The Crystal Iridescent Red Pearl flawlessly combines two colors together, a dark (elephant) gray color in the center is surrounded by a rich and also dark (wine) red that expresses both a silky matt and shiny surface at the same time. This unique pearl color is very interesting and will be a fantastic element to integrate into cool, edgy jewelry designs. The Crystal Iridescent Red Pearl color matches perfectly with the new Crystal Lacquer Effects of Crystal Dark Grey and Crystal Dark Red. The versatile combination of red and grey is ideal for creating progressive rock-chic themes and very elegant designs. Now Swarovski has partnered with Céline Cousteau, granddaughter of legendary ocean explorer Jacques-Yves Cousteau, on a second special crystal collection: Tribute to Tribe. Famous for her commitment to protecting the world’s oceans, the renowned filmmaker and environmentalist is also the spokesperson for an indigenous tribe in the Brazilian Amazon whose mission is to preserve their ecosystem. 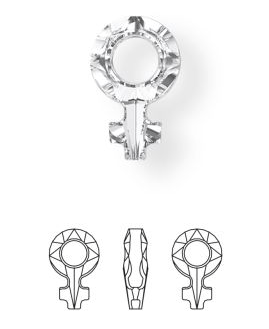 Cousteau’s designs are inspired by tribal decorations painted or tattooed on bare skin, which express coexistence with nature, and include the new Oval Tribe Fancy Stone, the Rhombus Tribe Fancy Stone, and the Cross Tribe Pendant. A desire for remote places and an understanding of their cultures coins a new design of ethos, where global references and mediums are mixed and matched to create a contemporary appreciation of the remote and unknown. The new Crystal Cross Pendant is not only a beautiful rendition of a tribal-inspired design, it also offers a subliminal form of acceptance, challenging us to put away the fear and discrimination’s of our past and embrace a multicultural future. 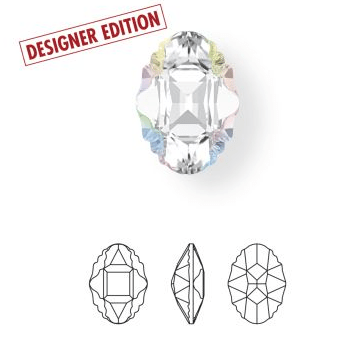 This new Swarovski Crystal Designer Edition Fancy Stone was designed in collaboration with Céline Cousteau and are symbolic of a pristine coexistence with nature and as such, are part of a long tradition in which it has always been natural for man to decorate himself, be it reasons of aesthetics, status or celebration. 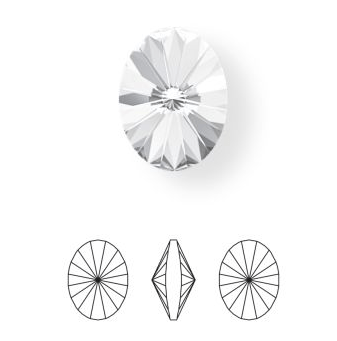 The 4926 Oval Tribe Fancy Stone is a multilayered cut crystal with cavities provided with coatings. This intricate style will be a fabulous edition to DIY enthusiasts, Jewelry makers, apparel and accessory designers. 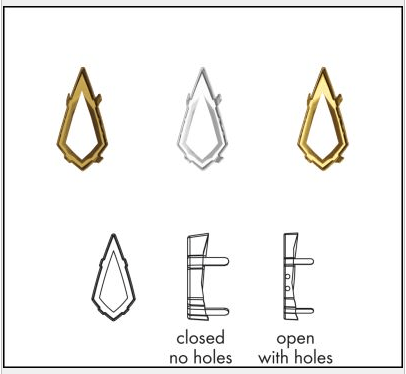 This Crystal Fancy Stone is suitable for setting into pre-cast settings (matching settings are available from Swarovski, please contact us for details) for making jewelry or accessories, and/or gluing into molds using Ceralun. This beautiful style will differentiate your designs from others due to its unique look, merging traditional tribal patterns with modern techniques. 1. 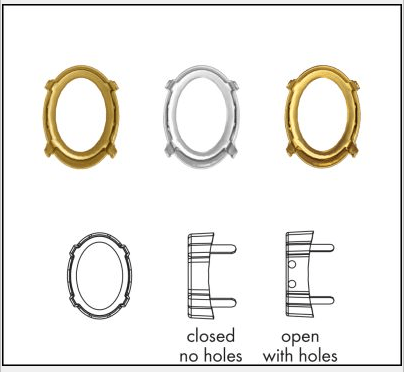 No holes with a Closed Back in one plating option, Unplated (the unplated looks like brass). The unplated gives you the opportunity to have your own specific plating applied if so desired. 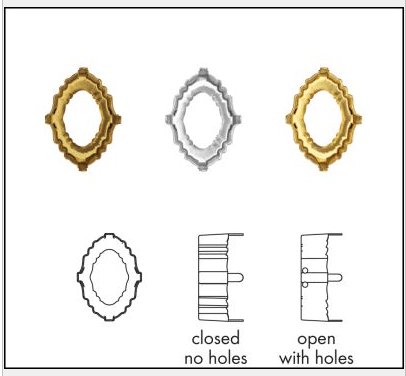 Please note that the plating should be applied before the stone is set. 2. 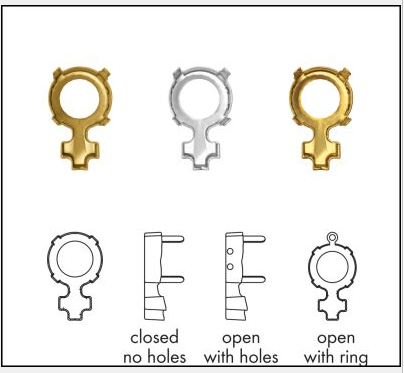 Two holes with an Open Back in three different plating’s, Unplated, Gold or Rhodium. The Rhombus Tribe Fancy Stone is not only a beautiful rendition of a tribal-inspired design, it also offers a subliminal form of acceptance, challenging us to put away the fear and discrimination’s of our past and embrace a multicultural future. This classic oval shape enables people to create a wide variety of beading, jewelry and textiles designs from delicate to bold, for enduring fashionable looks. The Rivoli Stone comes to a point on both side, which is very popular for seed beaders. 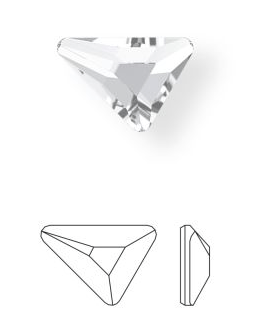 Swarovski launched the original Oval Fancy Stone in the 1970’s and it’s timeless beauty has stood the test of time. Now this unforgettable style has returned better than ever after integrating the standards of Swarovski’s technology into this stunning stone. The 4731 Kite Fancy Stone combines a very traditional fine-jewelry shape with a brilliant new contemporary cut. This innovative new shape lends itself to versatile design possibilities and this graphic and modern shape enables the creation of floral and mosaic designs. This symbolic Fancy Stone has a multitude of potential uses. You can use the stone as a standalone in its literal way (gender association), but it is even more versatile if you take it out of its original context and use it as a design element when creating chains, and the very popular style of layering necklaces pairing different patterns together.The unfoiled version is ideal for use in macrame designs (a knotting technique). 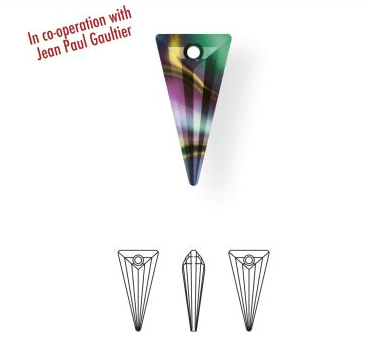 The foiled versions are available in three different setting versions, supporting creative freedom in sewing and soldering, as well as pendant options. 2. No holes, Ring on Top with an Open Back in three different plating’s, Unplated, Gold or Rhodium. 3. 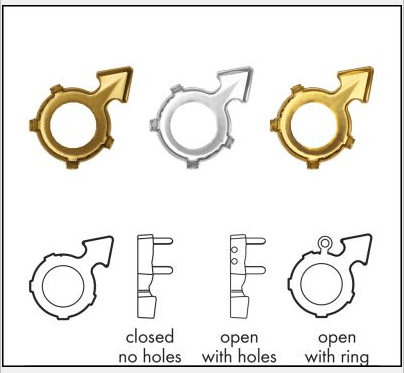 Two holes with an Open Back in three different plating’s, Unplated, Gold or Rhodium. This symbolic Fancy Stone has a multitude of potential uses. You can use the stone as a standalone in its literal way (gender association), but it is even more versatile if you take it out of its original context and use it as a design element when creating chains, and the very popular style of layering necklaces pairing different patterns together. A mix and match mindset captures the design world as global consumers expect individual styles and tailored one-of-a-kind solutions. People embrace multiple style directions referencing their flexibility and openness, swaying between expressive glam-rock and grounded Shaker-inspired looks. There are still a few more items to show you, I am working as quickly as my fingers can go 🙂 Please check back with me soon for new updates! The New Swarovski Fall/Winter Innovations will be added to the website soon, but in the meantime we have listed everything available to be ordered in this spreadsheet below. Please contact me with any questions you may have, as I am always more than happy to help!